What are monster trucks? A monster truck is very much alike the pick up truck but a much bigger vehicle and is used for a completely different purpose altogether. They are built with huge wheels and equal amount of suspension for load bearing purpose on the truck. 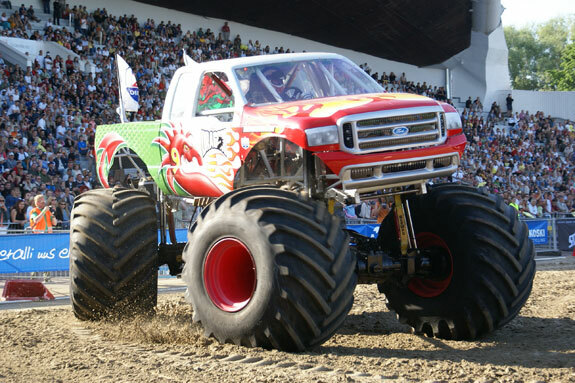 Monster truck racing is popular sports entertainment in the North America today. There are other races like motocross, mud bogging and car eating robots in the same category but the monster truck racing is the most popular of all. The show consists of a huge monster truck which will try to crush all the cars beneath it and on the ground. In some events there is one truck only performing in the arena and in events like competitions there will be two are three trucks trying to crush the cars. Whoever crushes the most number of cars will be declared the winner. Collisions of trucks are avoided by making barricades for the trucks and also the trucks will have to play by some rules. These trucks are also designed to cross over man made barricades and these features also have been included in the game. The place where the monster truck racing is held will typically be a huge ground with lot of mud and slush and by the end of the game the trucks turn up completely smothered with dust and smog. The audience is placed at a safety distance so that they can only watch. Several people from all over the United States and even other countries turn up to see these shops wherever they are held. 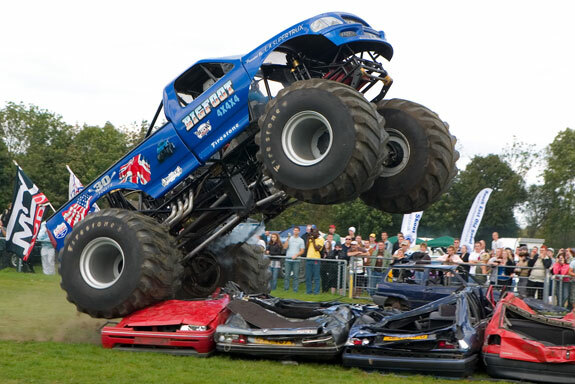 The Monster Trucks have also caught up in popularity in countries like England, Australia and Canada. Children’s entertainer like Disney has made several toys base don the monster trucks and they even have cartoons that feature these trucks. So the monster Trucks is among one and all in the United States. It is considered next to the NASCAR racing in popularity because of the number of show tickets sold every year. In the recent years there have been more developments in the Monster Truck racing and the competitions have developed something like free style where the truck alone performs. It need not necessarily crush only cars and when it crushes other smaller cars it is considered extreme sports in the United States. The drivers of these monster trucks try several tricks like wheel stands and jumps. It is easier said than done in reality. A person who can handle such a big vehicle to do such stunts without rolling over is almost considered a hero because of their handling power. It is somewhat like wrestling in many ways because of the macho image it has achieved in the arcing industry. In the typical monster truck car crushing shows many obstacles like school bused and even small sized air planes are placed in the way of the trucks. Several times the truck may not end up crushing the vehicle but the game is all about perception on the battle field.